Students must have a study score of at least 30 in English Units 3 and 4 (ESL) or 25 in any other English. 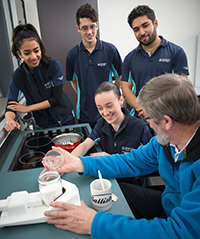 It is recommended that students undertake VCE units three and four in at least two of the following: Biology, Chemistry, Geography, Health and Human Development, Psychology or Physical Education. Please note that these are not pre-requisites, however a study score of at least 30 in any two of Biology, Chemistry, Health and Human Development, Geography, Psychology, or Physical Education = an ATAR 2 points higher. Application for entry into the Bachelor of Occupational Therapy (Honours) is through VTAC: Victorian Tertiary Admissions Centre. Please see www.vtac.edu.au for further information.